High purchase prices mean EVs remain unaffordable for most Caribbean drivers. 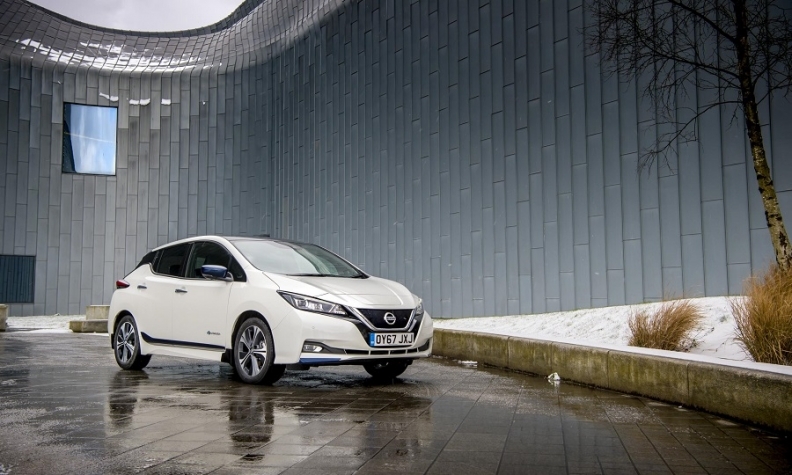 A Nissan Leaf costs about $50,000 in Barbados, compared with $30,000 in Britain. BRIDGETOWN, Barbados -- With her foot down to show off the acceleration of the zippy electric car, Joanna Edghill spins around the car park before plugging the vehicle into a charging point beneath rows of solar panels converting the Caribbean sun into power for the grid. In the five years since she and her husband started their company Megapower, it has sold 300 EVs and set up 50 charging stations plus a handful of solar car ports on the 34-kilometer long (21 mile) island of Barbados. They are now expanding elsewhere in the Caribbean. "The main factor with islands is we don't have range anxiety. I can develop and roll out a charging network in Barbados where customers are never more than a few kilometers from a charging point," said Edghill, who previously worked in international development. "We have at least 220 days of pure sunlight every year, so why not take advantage of the resources that we do have here?" Burdened by a costly dependence on imported fuel for energy, Barbados and many other Caribbean islands are considering boosting the number of EVs on their roads. But they face barriers, including high initial costs, stiff import duties on EVs and a lack of regulatory support, say people working in the sector. Globally, the number of electric vehicles topped 3 million in 2017, according to the International Energy Agency (IEA), which predicts there will be 125 million in use by 2030. That figure could go as high as 220 million if action to meet global climate targets and other sustainability goals becomes more ambitious, says the IEA. More research, policies and incentives are needed to drive further uptake, it notes. In Barbados, the island's electricity utility, government departments and private firms are among the customers buying the electric cars that Megapower imports from Britain, Edghill said. It has also built solar car ports, which power charging points, for the Barbados arm of courier giant DHL and the government of St. Vincent and the Grenadines. Megapower's other solar panels feed into the grid, offsetting the equivalent of the non-renewable power used by 400 EVs. "The Caribbean is ripe for the electrification of transportation," said Curtis Boodoo, assistant professor at the University of Trinidad and Tobago who also works on EVs with the CARICOM regional group of 15 countries. "If you invest in electric vehicles, you are able to use your existing electrical infrastructure, and save the costs of the transportation fuel that you have to import." Pumping fuel into electricity generation is two to three times more efficient than putting it directly into car engines, he said, meaning more EVs on the roads could help shave the region's hefty bills. For many Caribbean countries, over half the amount of fuel they import is used for transport. Barbados spent $300 million last year on fuel imports, government data shows. Crippled with public debt and dogged by rising oil prices, the island's new government wants to make its bus network electric, and eventually switch all government transport too. Boodoo said increased state investment in electric buses would help upgrade transport systems, while cutting climate-changing emissions and paving the way for consumers to follow. Plug-in vehicles could also "piggy-back" on a push to inject more power into the grid from renewables like solar, wind and hydro, said Devon Gardner, CARICOM's energy program manager. Costs are high, however, and on some islands, import duties for EVs are higher than on combustion-engine cars. Trinidad and Tobago have scrapped taxes and import duties for most EVs, but taxes elsewhere can add up to 100 percent depending on the model. High purchase prices mean vehicles remain unaffordable for most Caribbean drivers. A Nissan Leaf electric car, for example, costs about $50,000 in Barbados, compared with $30,000 in Britain. Heavily indebted Caribbean countries are torn between collecting much-needed revenue from car imports and supporting the roll-out of private EVs, said Gardner. "The Caribbean doesn't have the luxury of using some of the levers of incentives that were used by the richer, more developed countries," he said. Nonetheless, power utilities in the Bahamas, Turks and Caicos, and St. Lucia are starting to install charging networks, which could help the sector expand, said Megapower's Edghill. "Privately owned utilities want people buying electricity, so every person that is plugging in is a person not buying gas or diesel, but buying their product," she said. John Felder, who founded Cayman Automotive, plans to open an office soon in Havana and anticipates a healthy market in Cuba for electric bikes and scooters which start at $800. Low import duties on EVs in Cuba make them cheaper to buy, said Felder. He has sold about 60 electric cars in the Cayman Islands -- which has cut import duties -- and installed 15 charging stations he wants to convert to solar. "The ecosystem is very fragile -- there are no freeways where you can go 70, 80 mph for hundreds of miles," he said. "Electric vehicles are perfect for the Caribbean." While fast-improving battery technology is making EVs more attractive globally, on hurricane-prone Caribbean islands, emerging vehicle-to-grid technology could use power stored in batteries to keep the lights on if disaster strikes. Power stored in one electric bus could provide energy for up to 50 homes for a day, or power shelters and community centers if overhead electricity cables are knocked out, said Boodoo. Driving down prices might be key to kick-starting an EV revolution. But some bet islands will gradually wake up to the benefits plug-in vehicles can bring by improving public transport and taming expensive diesel habits. "I'd like to say that within five years, 10 percent of the (Barbados) population will be driving electric vehicles - I think that's realistic," said Edghill.